Culligan Dealers from all over Canada and the US are providing resources and aid to those in need. Photo from CulliganCares.org. 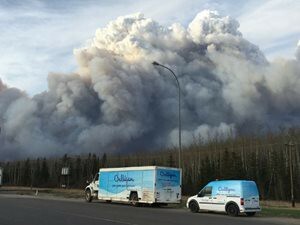 Culligan Water is actively engaged in the ongoing situation in Fort McMurray. Our dealership is committed to providing the people in this area with water to help them through and we are continuing to send out more every day. Dealerships across Canada are sending out truckloads of water to help with the tragic disaster the wild fires have caused. Fort McMurray has counted on Culligan for its water treatment for years, and we are committed to supporting them during this difficult time. If you would like to make a donation to support the people of Fort McMurray, please visit RedCross.ca. Reverse Osmosis Drinking Water – The best solution for great tasting water right at your kitchen sink in almost limitless supply. Bottled Water Delivery – Fast, Dependable service from your Culligan Man. Water Filters and Treatment – There’s nothing worse than investing your time and money for a solution that doesn’t work. Let us help you make sure you get the right water filter and water treatment the first time! Water Softeners and Conditioners – Some competitors try to make you think there’s some sort of difference between “softened” and “conditioned” water but the 2 terms have been interchangeable in the water treatment industry for about 80 years. Salt Delivery – Tired of lugging around 50lb bags of salt or running out of soft water? Water Testing – In most cases, before we can recommend the best treatment, testing your water is the first step. After all, how can we treat your water if we don’t know what’s in it? Bottle-Free® Coolers - An environmentally friendly, cost-effective way to get bottled water in your office without any bottles! Commercial Softeners or Conditioners - Whether for a restaurant, car wash, hotel, or hospital, Culligan has the best water softeners to save you time and money each month on soap and cleaning expenses. Commercial Reverse Osmosis - Best in the industry Commercial and Industrial sized Reverse Osmosis systems engineered for your required flow rates, water quality, and budget.